This week's rain is a pleasant surprise to some Arizona farmers, who are dealing with a drought they hope doesn't dry up business. In Yavapai County, rain from Tropical Depression Rosa is a big deal to Gary Mortimer, who owns Mortimer Farms. "It definitely helps," Mortimer said. "Every drop helps. The timing was good, and the amount of rain that came was just perfect. It soaked into the ground. It was a beneficial rain." Mortimer told ABC15 rain from the Monsoon, and Rosa, have helped alleviate some concerns about the drought. Prior to this Summer, Mortimer said the drought was as bad as he'd experienced in more than 15 years. "It was tough," he said. "We didn't know how long it was going to last." Earlier this year, The U.S. Department of Agriculture designated Yuma and Yavapai counties as "primary natural disaster areas." The designation gave eligible farmers eight months to apply for assistance, such as emergency loans, through the Farm Service Agency. The designation aims to help offset losses and damages caused by the drought. "I've talked to ranchers who have ranched in our state for over seventy years," said James Mago, the state executive director for the Farm Service Agency. "They say this is as bad as they've seen." Mago told ABC15 rain from Rosa is an overall positive, but will have varying effects across the state. "From a forage standpoint, Rosa was fantastic," he said. "It's going to help rangeland and the forage. From a cotton farmer standpoint, this rain was not good...the cotton is getting close to harvest, and the rain hurts the quality." Rosa's impact on the drought is yet to be seen. 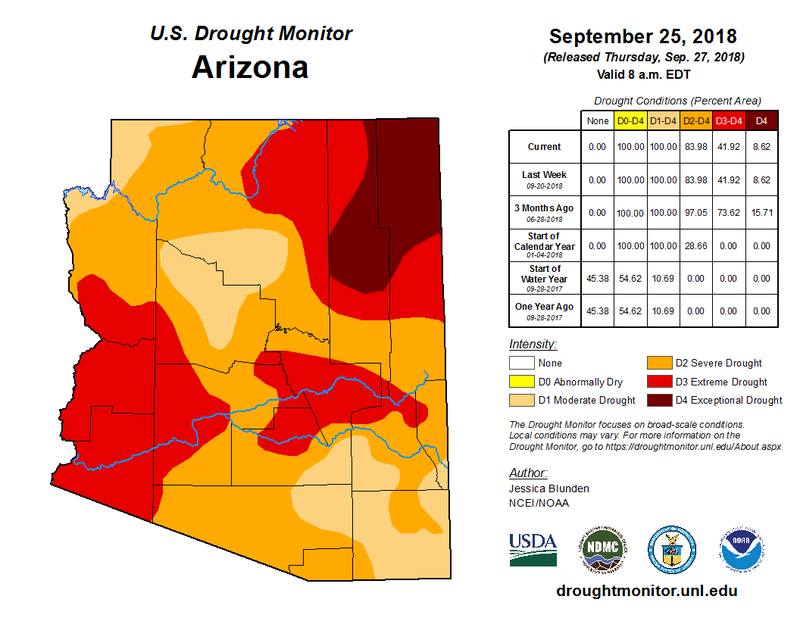 The drought monitor is updated on Thursday's, and as of the last update, it indicated nearly 84% of Arizona is under at least a "severe drought." After a rough start to the year, Mortimer says he is feeling better about the future. "It's optimistic," he said. "Absolutely. It's really good. Since the summer rains, we have tons of forage on the ranch. Everything (is) recovering."